The Business Rules that express a Policy and are applicable to a Business Process. The Business Rule Tasks that express a task or decision that the business processes must make. The domain or information elements that represent the vocabulary or facts that the Business Rules relate to. The Business Rules can also be related to Policies from which they derive and Requirements which they realize and application services that implement them. 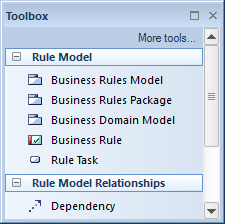 The Business Rules Model can be used to formally model business rules and the way they are applied in a rule task. 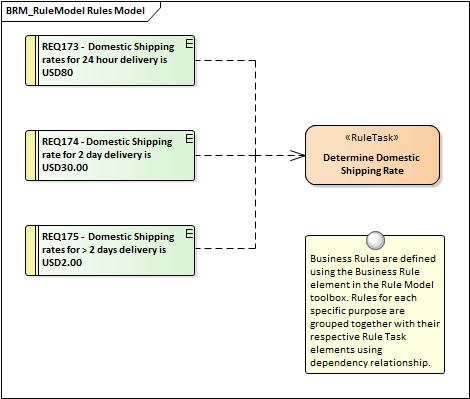 The model provides a useful way of structuring the rules as a group by connecting them to a Rule Task which can be related to the Business Process where the rules are being applied. This has the effect of reducing the clutter on a Business Process Diagram and showing how the Business Rules apply as a set. The important information elements and facts can also be related to the Rule Tasks again reducing the clutter of connecting individual domain elements with specific rules. The Business Rules and the Rule Tasks can be related to Policies, Requirements, Business Processes and other model elements creating an articulated model that shows how the business rules are applied. Behavioral models can also be generated from the Business Rules Models.